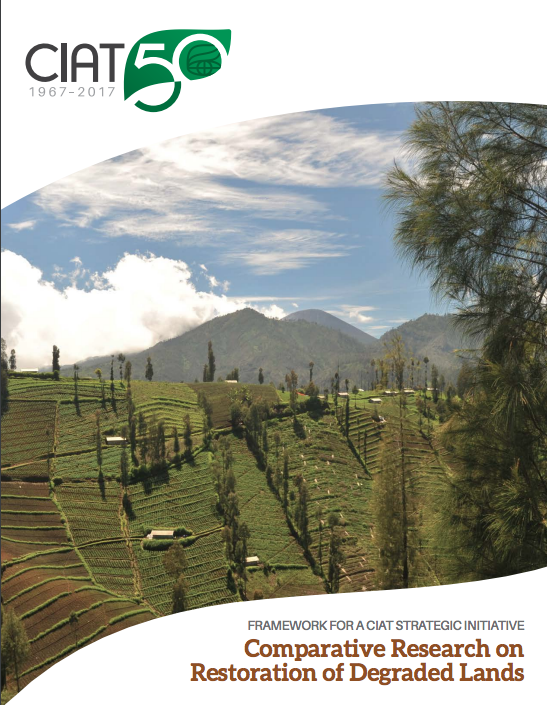 A new roadmap outlining CIAT’s strategic vision for Africa 2017–2020 was launched in 2017. It highlights the organization’s goal in the region: to promote more productive, profitable agriculture and healthier diets at no environmental cost by providing a scientific basis for development investments and policies. 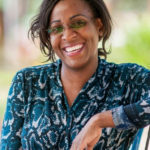 “While sub-Saharan Africa is undergoing rapid transformation, with intensification of agriculture on smaller plots of land and with urbanization affecting agricultural innovation in rural areas, the shift represents great opportunities for the continent,” said CIAT Regional Director for Africa, Dr. Debisi Araba. To run successful and profitable agricultural businesses, smallholder farmers need improved crop varieties, good quality and affordable seed, organized channels to sell their produce, and access to market information, among many other things. Yet too often, they find themselves trapped in a vicious cycle: low-quality seed and inadequate agricultural practices leading to low productivity. CIAT has the world’s largest collection of common bean and tropical livestock grass seeds. By protecting and improving this collection, our research aims to both improve seeds and get them to more farmers, especially by partnering with the private sector and agribusiness for example. Africa is the only continent in the world where poverty and malnutrition are on the rise. Agriculture is a source of nutritious food and income, enabling families, especially women, to afford diverse foods and services, such as better healthcare. Families can also build more resilient, healthy families by diversifying the food they grow on their farm. CIAT will generate evidence and support investment in nutritious diets, including ways to track malnutrition before it becomes a crisis, putting in place a firm plan to help families put more nutritious food on the table. Since at least the 1970s, food crises have seemed to strike sub-Saharan Africa with frequency. Yet, it’s malnutrition and its consequences that is the enduring problem. While one in nine people in the world today is malnourished, in sub-Saharan Africa, it is one in four. Malnutrition is arguably Africa’s biggest impediment to sustained, equitable economic growth. In response, CIAT is developing a Nutrition Early Warning System, or NEWS, a system that will take advantage of the latest advances in “machine learning” to process a constant flow of data relevant to food and nutrition. By mining the data, NEWS will provide two key outputs: an early warning system to alert decision-makers of nutrition threats well ahead of a crisis; and ongoing surveillance to provide multiple options for nutrition interventions. CIAT is currently working to develop a prototype, which will initially analyze the nutritional status of populations in selected countries in sub-Saharan Africa to find options for successful interventions. About two-thirds of Africa’s land is degraded, while three percent of the gross domestic product is lost annually from soil and nutrient depletion from farmland. Strategies are needed to increase agricultural production without putting more pressure on our natural resources: soils, land, water – at no expense to farmers’ livelihoods – especially the livelihoods of women. Our research aims to make farms and whole landscapes more resilient and sustainable, providing information about how to improve soil, water, and natural resource management, while building up data and the information base to address landscape damage at a bigger scale. Restoration of degraded lands is an important component of climate change mitigation and adaptation schemes, poverty reduction efforts, actions to improve ecosystem services, and programs aimed at ensuring food security. Initiatives such as AFR100 are working to mobilize resources in Africa and attract the private sector to take actions to the scale needed to properly address the problem. To be effective, these programs need innovative approaches and require scientific support and backstopping. CIAT research will address key issues that include: (i) Developing effective policy interventions and integration of restoration objectives in national policy frameworks; (ii) Supporting improved design of restoration projects by learning lessons from first-generation restoration activities; (iii) Developing standardized, widely accepted, credible, and scientifically sound methodologies for restoring degraded ecosystems that can be adapted to local conditions; and (iv) Supporting countries and projects to develop and use efficient approaches for monitoring and measuring the social and environmental benefits of these efforts. Climate change and variability put crop productivity at risk, and make pest and disease outbreaks more likely to increase. Small-scale farmers in Africa are particularly vulnerable, and need help to make their farms more resilient. We will generate and share robust evidence of the risks associated with climate change – and importantly, the opportunities to address these – especially by generating evidence and options to guide investments in climate resilience. The way we produce food has never been more complicated. Intricate systems govern not just how much and what type of food we’re able to grow globally, but how much of it ends up on our table, and how much we will pay for it. Climate change poses a real threat to food systems, particularly in Africa, where agriculture is inextricably linked to the whims of the weather. Yet solutions for a more resilient food system, able to withstand climate shocks, often fail to address the problem in its entirety. In my conversations with farmers, communities say they need long-term solutions to climate threats, not just emergency responses to imminent threats. But we can’t do this if we focus on single value chains, or one commodity: climate change affects every aspect of the food system. Food systems encompass everything from drought-tolerant seeds to food waste, to policies that provide a favorable environment to make crop exports possible. These are all parts of the same puzzle, and they all face the very holistic threat climate change poses to our food supply. In 2017, 3 climate-smart agriculture country profiles were published for Zambia, Tanzania, and Mozambique. The climate-smart agriculture country profiles belong to a series of publications containing a brief yet comprehensive overview of the agricultural context and challenges in each country through a climate-smart agriculture lens, and provides a snapshot of the key issues, climate impacts, CSA practices, relevant policies, and financing opportunities for scaling up the promotion and adoption of CSA interventions along specific value chains and in different agro-ecological regions.  So far profiles have been developed in Africa for Kenya, Rwanda, Senegal, Mozambique, Tanzania, Zambia, and Uganda and are currently being developed for Ethiopia, Ghana, Mali, and Niger. The roadmap is built within the context of priorities that both public and private actors can invest in, and set within the framework of the United Nations’ Sustainable Development Goals (SDGs). It highlights the power of partnerships. The private sector, NGOs, governments, development partners, and farmers will remain vital to our work. As well as involving partners closely in the research process, CIAT’s research findings aim to help them make informed investments in agriculture, prioritizing limited resources for a healthier, wealthier continent. 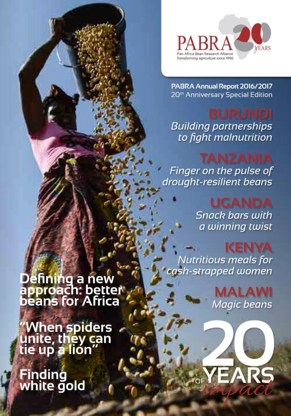 The development and dissemination of new bean technologies in Africa is orchestrated by the Pan-Africa Bean Research Alliance (PABRA), which is coordinated by CIAT and unites 30 member countries. The alliance was formed in 1996 as a collaborative mechanism with joint ownership for bean research between national agricultural research systems (NARS), CIAT, and principal donors. Thanks to PABRA, capacity in bean research in the NARS has been developed and maintained over time in Africa. In 2017 PABRA celebrated 20 years. Yet too often, interventions address single value chains. Let’s look at an example from Kenya. 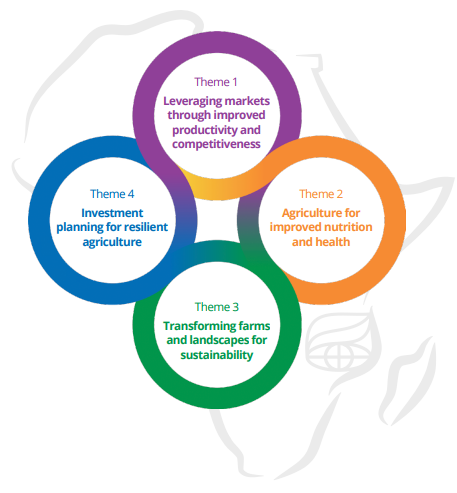 Agriculture is central to the country’s food security and economic development, contributing 28% to the country’s gross domestic product (GDP), accounting for 65% of exports earnings and employing over 70% of the rural population. In Kenya’s Tana River County, farmers have been encouraged to grow mangoes, because they generate a higher income. Yet flooding along the Tana River basin – Kenya’s main water source, supplying 90 percent of Nairobi’s water – has been exacerbated by climate change. Floods have hit mango harvests badly. Do they have effective storage to save what harvests are left? Have farmers diverted valuable financial resources away from goats to produce more mangoes, and will their families have less nutritious milk or meat as a result of failed harvests? In Kajiado County, keeping livestock is a way of life, and sustains farmers in the area. Frequent and prolonged droughts, and the urban sprawl of town settlements, have urged farmers to abandon their pastoralist way of life and move into high-value crop production. Yet they don’t have much knowledge about producing high-value crops, nor the resources to set up irrigation systems. How can we help them become more resilient, to earn a sustainable way of life and provide for their families as well? The food system is a web of interactive consequences. Solutions lie in uniting all players in the food system, including those involved in production, storage, to markets and supermarkets – and the physical, cultural, and political environment within which all these processes take place. If Ministries of Agriculture focus on increasing staple crop yield, while Ministries of Health focus on nutritious diets, how will we boost yield of highly nutritious foods? We can’t eat nutritious food if farmers don’t grow it. Farmers won’t grow it if they can’t buy seed, or make money. Using new digital tools like foresight mapping, we can now use historic and current data to map different scenarios, prioritizing threats and investing in a more resilient Plan B. Researching knock-on impacts and mapping the outcomes of different scenarios, combining local knowledge with scientific data, will be vital to build more resilient plans B in the future. In Tanzania, for example, maize is the most important staple crop. Let’s say drought projections show Tanzania’s maize harvest will halve by 2050. We could recommend policies to help farmers shift to more drought-resilient crops, or boost supply of drought-tolerant maize seed. Let’s say higher temperatures increase maize yields by 2050 instead. We could recommend regional trade integration and improved export incentives so that Tanzania could benefit from a maize surplus; or investing in better storage to protect higher harvests. We need to invest more in digital tools such as foresight mapping, combined with local knowledge, which can help us understand the bigger picture, and track changes over time. This work will help us put in place a more resilient plan B, C, and D as well, because Plan A – business as usual – is already out of time.